If there is one consistent theme running through the National Retail Federation Big Show the past several years, it would have to be this – disruption – disruption from the technologies that revolutionize the way consumers shop to the behaviors that drive the changes, and new players that challenge the status quo. This year’s Big Show, taking place January 14-16, will be no different. But in the Salesforce Big Idea session, You Can’t Spell Retail Without AI, I’ll point out that for all the benefits technology has brought to retail, it has created a data deluge that in many ways has clouded retailers’ view of the person that matters most – the shopper! Enter artificial intelligence. When infused throughout the shopper journey from discovery and marketing to commerce and service, AI has the power to transform the relationship between retailers and consumers, and will ultimately be what separates the leaders from the laggards. Simply put, retail today, and certainly five years from today, will not be possible without AI. 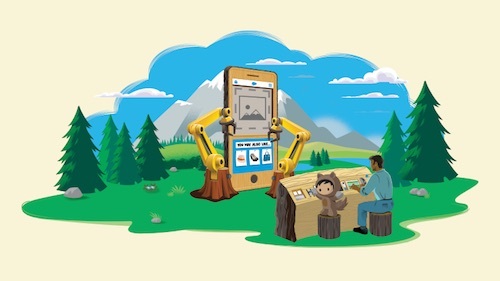 The session will delve into the factors driving a notion first presented in November by Salesforce CEO Marc Benioff at Dreamforce: the Fourth Industrial Revolution, where intelligence is transforming the consumer experience. The factors include decreasing cost of computing power, billions of connected devices, and the ease of using sophisticated algorithms, machine learning, and other forms of artificial intelligence to deliver personalization that in the past required a team of data scientists. The Revolution is happening because shopper expectations are higher than ever, and because customers are getting comfortable using AI and IoT as part of their everyday lives. Need proof? Look no further than Facebook autotagging or the millions of people asking Alexa, Siri or Google Home to perform a task. Today’s shopper traverses digital and physical channels, jumping across mobile, web, email, social, contact centers, and of course, the store. Each of these interaction points provide a glimpse into who the shopper is and what they want. Retailers need to pull all of these signals together into a single view to deliver an intelligent shopping experience. Of course, as NRF attendees well know, this requires a complete transformation in the way brands connect with shoppers, a transformation made possible only with AI as the enabler to delivering faster, personalized, and connected engagements. 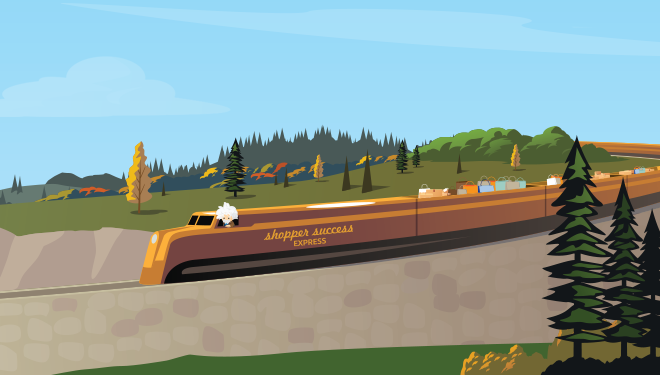 These experiences are within reach, with Salesforce for Retail. 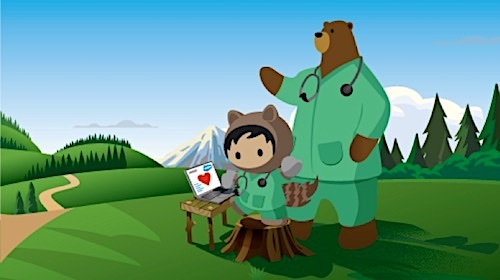 It is built on the Salesforce Platform, which delivers the skills, enablers, tools, and technologies needed to drive personalized, fast, and connected interactions from the first interaction to every interaction that follows. During our session, we’re going to talk about three retailers driving towards shopper success in the Fourth Industrial Revolution and how AI, and specifically Salesforce Einstein, is at the center of it all. First up, a global brand offering high end apparel and accessories, which has discovered how the convergence of mobile, social and AI hold the keys to reducing friction in the shopping experience. The retailer has tapped into its 2.3 million Instagram followers, empowering them to shop its products by tapping on shoppable image on Instagram. This is an enormously important capability as consumers drive ever-faster toward mobile. This past holiday, in fact, mobile accounted for 60% of traffic to retail sites, and an astounding 41% of orders, according to the Salesforce Shopping Index. Next, we’ll look at specialty food brand Stonewall Kitchen, which uses Einstein as a virtual sales assistant for online shoppers, offering them unique product recommendations based on their browsing history and preferences. If a shopper hits a curated story on its website, Stonewall Kitchen leverages AI to share complementary products; for example, a breakfast “story” would include pancake mix, jam or syrup. Smarter retail, powered by AI, unifies shopper signals to drive relevant product offers. In our session, we’ll share specific details of Stonewall Kitchen’s performance after it implemented Einstein Product Recommendations. 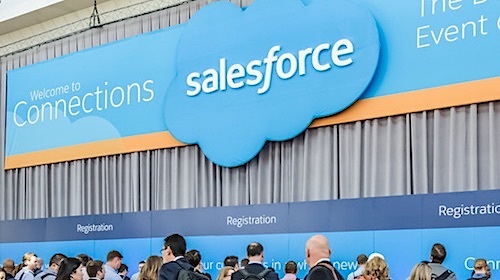 Finally, we’ll be joined by Design Within Reach and its SVP of Operations Bethany Kemp, who will share how various Salesforce for Retail solutions come together to deliver a connected, intelligent, fast, shopping experience for its discerning customers. I spend a lot of time talking with retailers (in fact I spent more than two decades at large brands including The Gap and Williams Sonoma) and I hear the same theme over and over again – how can we drive innovation at the clock speed of our shoppers given the massive disruption in retail? The thing is, disruption isn’t new, but we are in the midst of the Fourth Industrial Revolution, one in which our industry is being transformed by intelligence. It’s changing the way we live, work, and connect to each other and of course, it’s changing the way retailers and brands connect to their customers. Shoppers are engaged, and they’re everywhere, which means brands need to be engaged and everywhere. There’s a tremendous opportunity in the digital footprints left behind by shoppers. Join your peers in the retail community and register for the Big Idea session at NRF to learn how Salesforce can help you harness that opportunity. In the meantime, check out this best practice guide for implementing AI-powered commerce with Salesforce Einstein, and click the button below for all the amazing Salesforce happenings at the 2018 NRF Big Show.